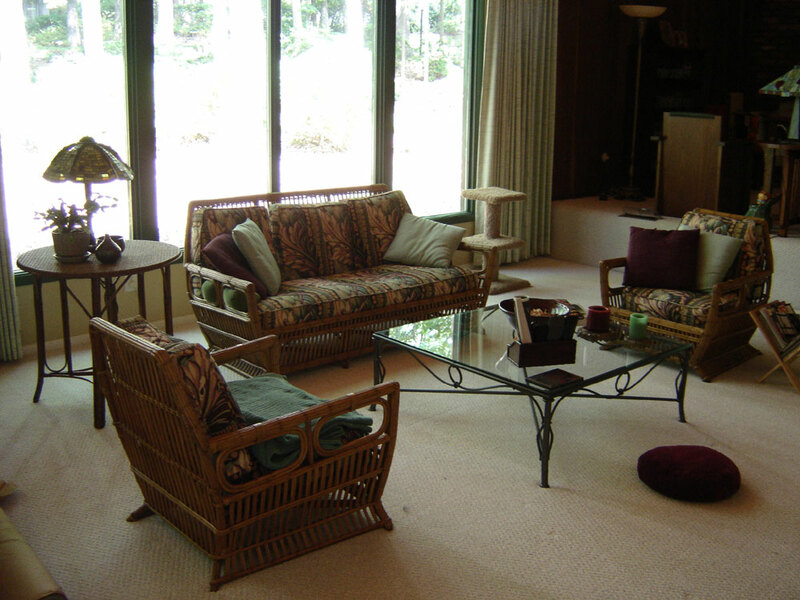 The sofa and two chairs above were given to Cindi's mom after living in the den near the fireplace. We were able to obtain a nice set of Arts and Crafts (AKA Craftsman) furniture, similar to the designs of Stickley, that was better suited to the size of the room. 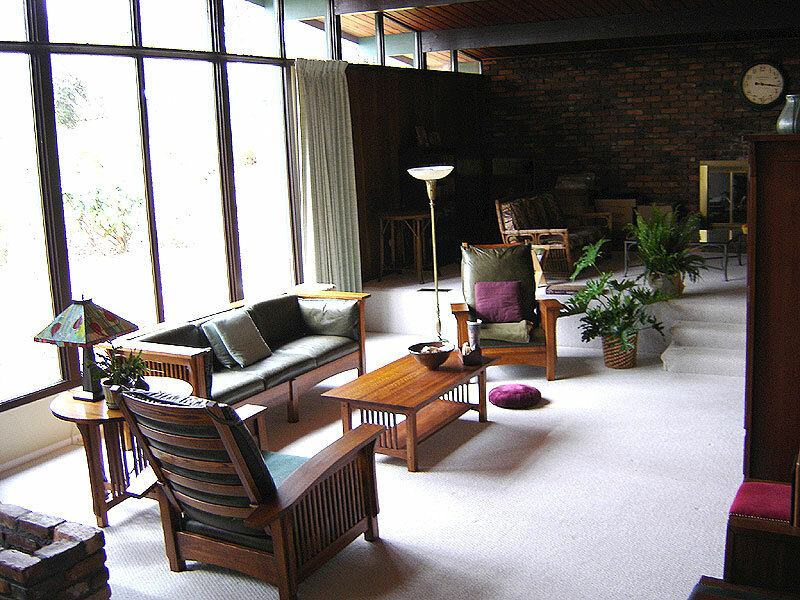 At that time we hadn't yet gotten the bug to go all Mid-Century Modern, so the furnishings more than sufficed for day-to-day living. You can see the reed sofa in the background. So I bet you're asking why I'm going through all this? 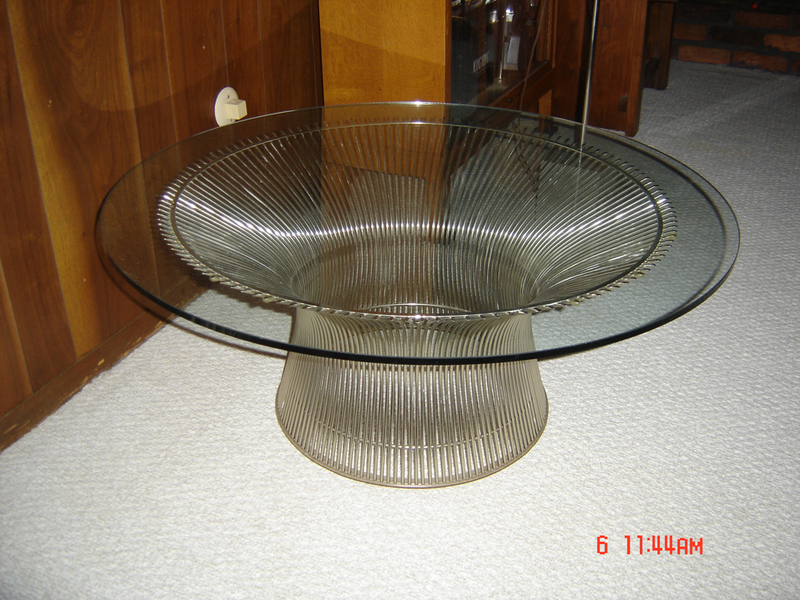 The Platner table came down from New York with Cindi's mom - and it looked really odd with the reed furniture - the high-tech chrome wires didn't work with the reeds in the couch and chairs. 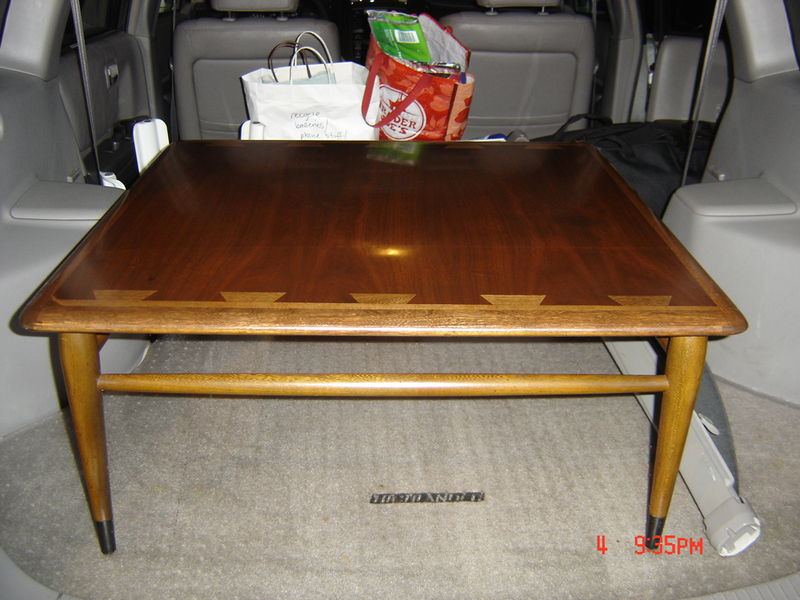 Since we were going all modern, we were offered the table - the only problem - she needed something that could replace it. After looking for a bit, we figured out that what she needed was something more in the same scale and a bit retro - ideally of wood or something with the same brown tones. We found a structurally sound Lane Acclaim table - a bit beat up, with water and mineralization rings on top and a hammered finish (it was also quite dirty), but we paid little enough for it that it was worth getting as a potential replacement after a bit of TLC. The things that sold me on the table: 1. It was all solid wood construction - even the flat table top was wood planks edge-jointed with the interesting walnut and oak veneers on top. 2. No racking or twisting to the legs - the end mortises into the legs and underlying supports made for a well-made, strong table. 3. Nothing in the finish looked like too large a task to re-do. 4. The veneers were all laying flat so I didn't have to worry about loosening the veneer and getting it to re-adhere (this last one fooled me a bit as I'll explain). 5. 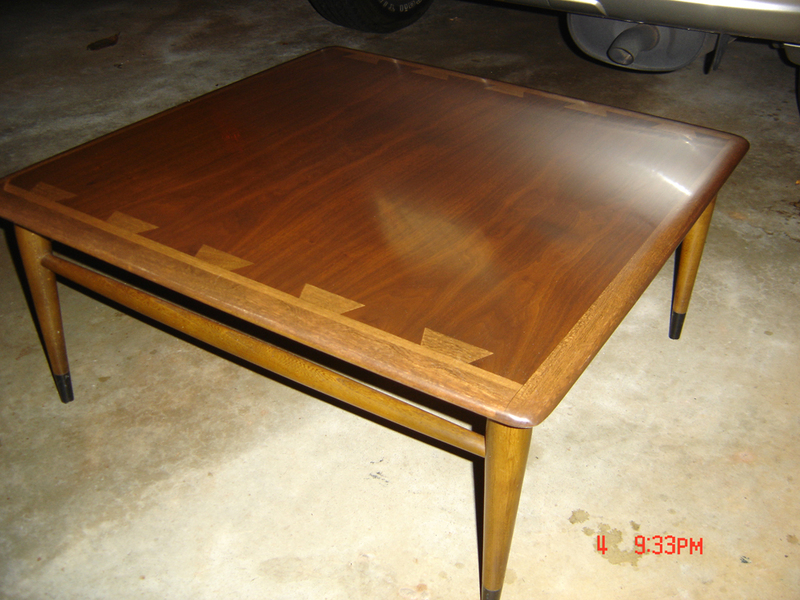 I grew up with Lane Acclaim (we had a rectangular coffee table and two end-tables) so I just like the design. A couple of things to note: 1. look at the near edge - see the spalting? That was all stained dark enough so you didn't see it before I stripped off the original finish. 2. Even being extremely careful, I managed to sand through the veneer in one corner (it's the one to the right - unfortunately out of frame) to the poplar beneath. I figured that once I stained and coated the top it wouldn't be noticeable, and for once I was right. You don't see it unless it's pointed out to you. 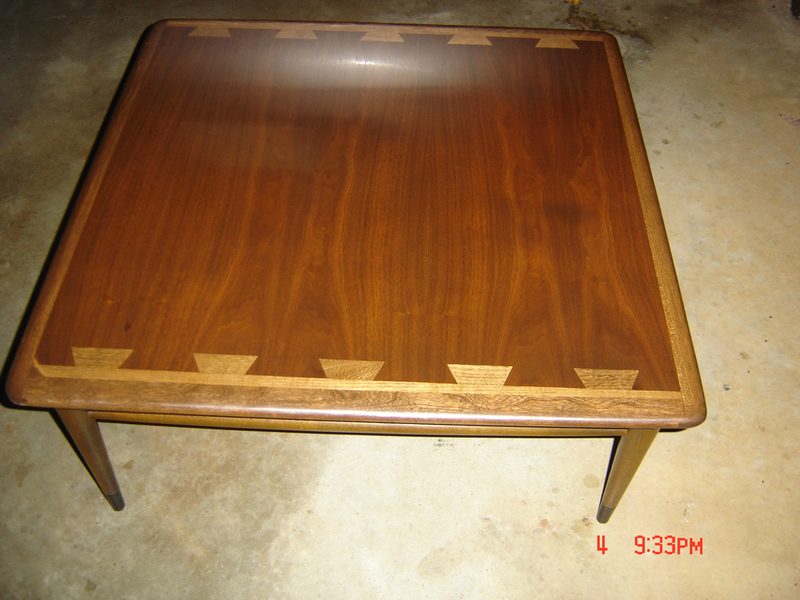 I did a few searches online to figure out what stain to apply - there's a Min-Wax that I found suggested on one blogger's post (pdx picker) with some photos and it seemed reasonable - the stain used was Minwax Early American. Remember, I wasn't looking for perfection here, just something I could quickly work out and deliver (note the date in the photo above is 19? That's 2012.08.19. I did want to do a reasonable restoration with colors approximating the original, along with a lacquer finish (what was originally applied). 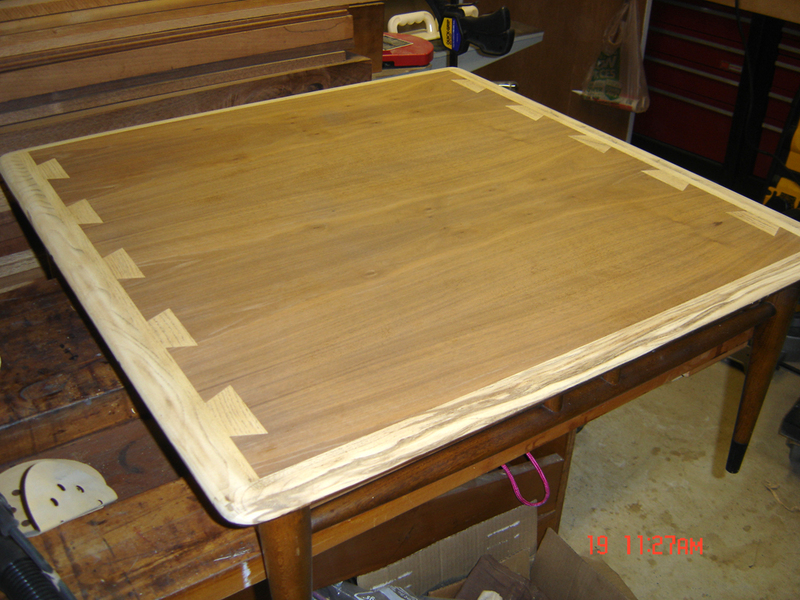 I figured I could apply a stain and go directly into a lacquer and be done. There's only one problem - I don't like Min-Wax. Oh, sure it's a good product, but the problem I have with it is that it already has a varnish added to it - which makes it impossible to adjust if your tint isn't quite right. I know that there are alternative ways to adjust, but doing airbrushed coats layered between sealers didn't fit into my "quick-and-dirty" idea. I did manage to find a finish that approximated what I was looking for - Varathane American Walnut found at the Home Depot. Now in retrospect, there's a bit more red and less yellow in this stain so it's not quite right, but close enough for me. One thing I noticed in some of the other Lane Acclaim refinsh photos available online - for some reason people are selecting finishes that don't bring the color of the oak down into the browns - the contrast to me is quite disturbing. In my case, except for the bit of red tint this is very close to the color of the legs. After a bit of block-sanding to get everything flat, I applied the lacquer. Now this is where I totally hosed everything. I had always applied lacquer in the past using a sprayer, or in a pinch, a rattle can - but in my rush to get this thing done I decided to apply it via brush. The problem here is that I don't own a good varnish brush - you want something that holds the varnish and lays down a very even coat with minimal brush marks - any ridging that happens will need to be sanded down. After two coats I had something that looked obscene and it took quite a bit of sanding to get it looking right. Of course there were some imperfections but I thought, OK I'll just apply some wax. Another mistake - the wax made every imperfection glow-in-the-dark and applied a glossy sheen that wasn't appropriate to the piece. I was going to strip off the wax but ran out of time. In desperation I just hit the whole thing with some 000 steel wool and got the finish back to something close to what I was looking for. As a last step I cleaned up the legs and applied a light coat of wax with very light buffing - that brought up the old finish to the same luster as the new. I'm not quite sure how it ended up being a 6 week project - I really thought I could get it done in a weekend. Lessons learned here: 1. 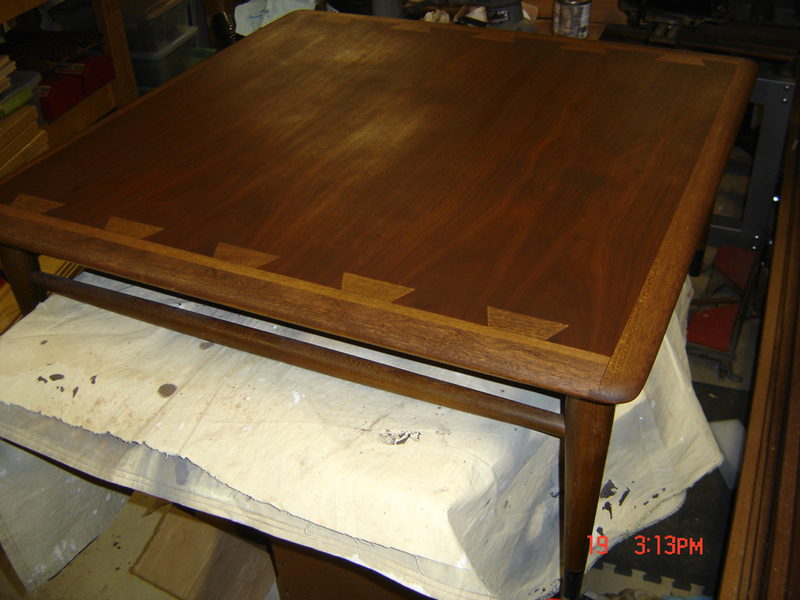 I'm too much of a perfectionist to do any "quick and dirty" projects when it comes to refinishing. 2. Invest in the time to get the stain right and don't settle for "close" 3. Always, always apply lacquer using the sprayer - for the time it took me to block everything out I could have purchased a whole case of rattle can lacquer. 4. Know you're still taking a risk in the veneer even if the pieces are flat (I actually think that the corner where I sanded through - you can see it in the last photo, the left corner closest to you - was thin to begin with, probably from the Lane factory. Great job. I agree, lacquer off - lacquer on. My restorations almost always have the same finish as they originally had, unless I am trying something totally different with the project. 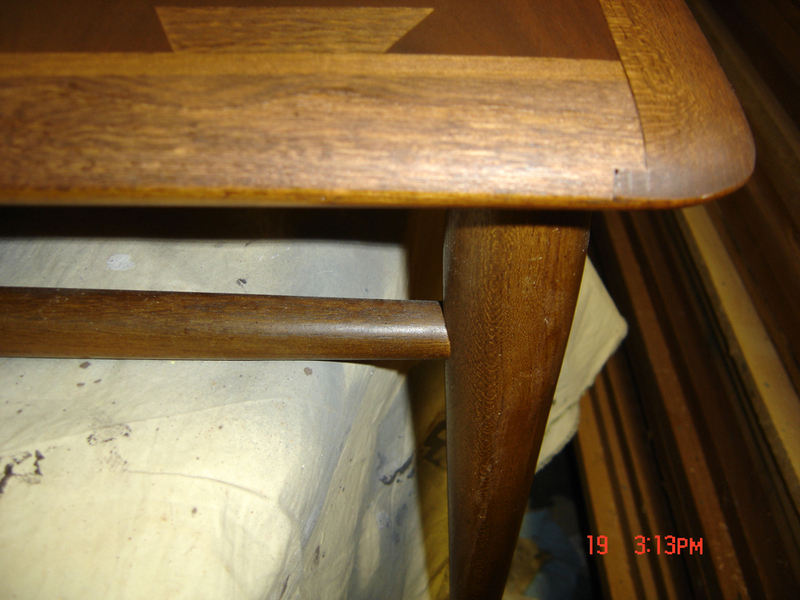 You are right, a spray finish, even from a rattle can, looks much better on stained furniture. How did you get the wood on the edge to darken because I can't ? Did you remove or otherwise sand off the old finish? What type of stain did you use? 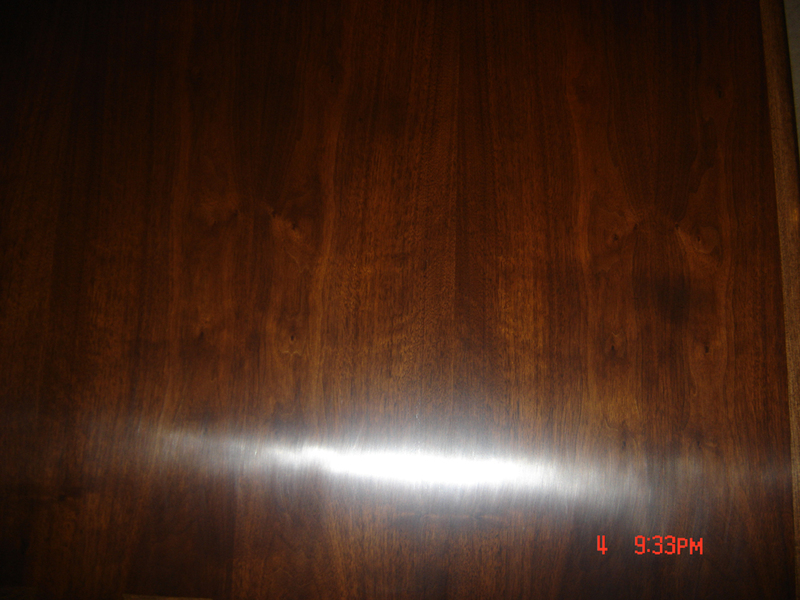 When refinishing Lane Acclaim, I avoid damaging the veneer by useing Zinser Brand Strip Fast furniture refinisher, applied with .0000 steel wool to take the finish off. I then lightly sand with 220 grit sand paper. I can usually strip a cocktail table in about an hour. 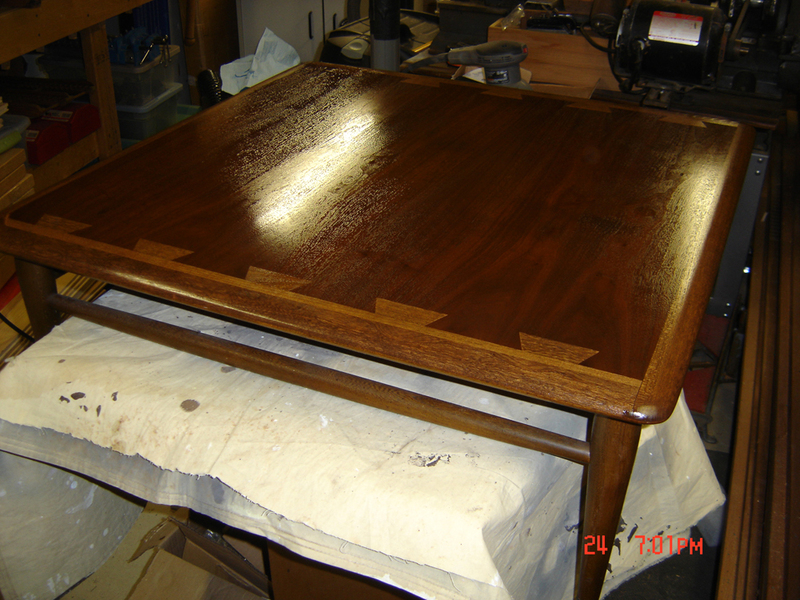 For a finish I use 2 coats of Verathane gel stain in dark walnut applied with a lint free rag, followed by 3 coats of Minwax polyurethane in semi gloss applied with a foam brush with a through rub down by .0000 steel wool between coats.